Dover International Speedway is gearing up for the biggest year in its history as the Monster Mile celebrates its 50th anniversary season and hosts its 100th Monster Energy NASCAR Cup Series race. The brainchild of former Delaware Gov. David Buckson, with funding largely provided by Delaware businessman and former Lt. Gov. John Rollins, construction on Dover International Speedway began in August 1967 by the Melvin L. Joseph Construction Co. from Georgetown, Del. The land where the Speedway sits today was previously a farm and local airstrip for small planes. Millions of racing fans have been flocking to the high-banked, one-mile concrete oval, known throughout racing as The Monster Mile, since the facility opened its doors. On July 6, 1969, Dover International Speedway hosted the “Mason-Dixon 300,” the first NASCAR event held in the First State. Then known as Dover Downs International Speedway, 10,509 race fans turned out on a breezy summer afternoon to see Richard Petty take the first checkered flag by a whopping six laps over the next closest finisher. 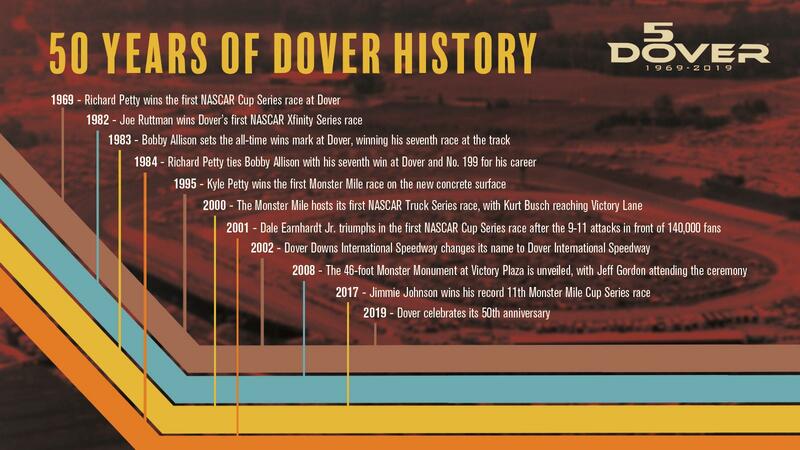 The track quickly became the premier home for motorsports in the mid-Atlantic region, as Dover continues to serve as the racing capital of the world twice each year and Delaware’s only top professional-level sports venue. Fans from all 50 states, and many foreign countries, attend every race weekend in Dover. The economic impact of the two NASCAR event weekends on the Delaware economy is approximately $94 million annually. The tradition continues with two NASCAR tripleheader weekends in 2019 on May 3-5 and Oct. 4-6. The Oct. 6, 2019 Monster Energy NASCAR Cup Series playoff race will be the 100th NASCAR Cup Series race in track history. Dover International Speedway will be the 10th track in the nation to host 100 NASCAR Cup Series races. In 2019, Dover’s iconic monster trophies will be converted from their customary concrete-like finish to a brilliant metallic gold color. Winners of all six of our NASCAR events will take home these unique-for-2019 trophies. A larger-than-ever FanZone, complete with the Monster Mile Youth Nation area for kids of all ages, will include more attractions, driver appearances and autograph sessions than ever before. More surprises and additions to race weekend activities will be announced in the coming weeks. The May 3-5 NASCAR tripleheader weekend includes the “JEGS 200” NASCAR Gander Outdoors Truck Series race on Friday, May 3, the NASCAR Xfinity Series Dash 4 Cash race on Saturday, May 4 and the Monster Energy NASCAR Cup Series race on Sunday, May 5. The Oct. 4-6 NASCAR tripleheader weekend includes the NASCAR K&N Pro Series East race on Friday, Oct. 4, the NASCAR Xfinity Series playoff race on Saturday, Oct. 5 and the Monster Energy NASCAR Cup Series playoff race on Sunday, Oct. 6.